A facial massage after a busy routine day can be extremely relaxing for you. 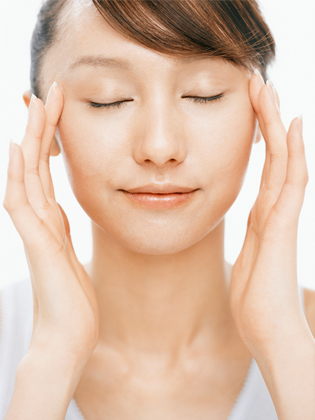 Proper massage of your face improves blood circulation to your face skin. Facial massages give rejuvenating effects to you and you look fresher than before. You can go for a facial massage to any massage centre or even beauty salons also offer this service. However, most of us don’t find enough time from our busy routines to go to a massage centre and many of us even can’t afford to pay so many bucks there. You can give a facial massage to yourself at home. First of all, you need to choose an oil which best suits you. The choice is completely yours and you have to make the selection according to your skin type. Apply a small quantity of oil on your face and start rubbing it with your fingers gently. Spread the oil with stroking movements on your entire face. Drop down your jaw and try to give the biggest smile possible. Hold it there for as long as you can. Gently stroke your face upwards, lifting up your skin gently with your fingers. Use your index finger and thumb to pinch between your eyebrows to release tension which builds up there. Use the index fingers of your both hands to pull apart the frown lines above your nose to the side of your eyebrows. Push your nose tip upwards with your finger and hold it firmly there. Take your upper lip between your teeth and pull it downwards to hold as long as you easily can. Use the middle fingers of your both hands and make circular movements from the top of your nose towards the nostrils. Use your ring fingers to gently apply pressure underneath your eyes, starting from the inside towards the outside direction. Take deep breathes while moving your fingers outwards. Move your eyes to look up, down, left and right simultaneously. Be sure not to move your head and only your eyeballs should be in motion. Hold one side of your jaw with your thumb and the inside of your index finger tightly to create a suction movement. Move your hand from the inside of your face towards the outer side and this movement will bring shine in your skin. Open up your mouth slightly, place a finger in it and stretch your mouth to one side as far as you can. Do the same on the other side. Make some deep strokes upwards on your face to finish the facial massage.